You need a basic resume template, because you're not one for so much pomp or boastfulness. No, for you, a standard template and cover letter fit the bill just right. You know you want basic templates for resumes, just not where to find them. Don't worry. 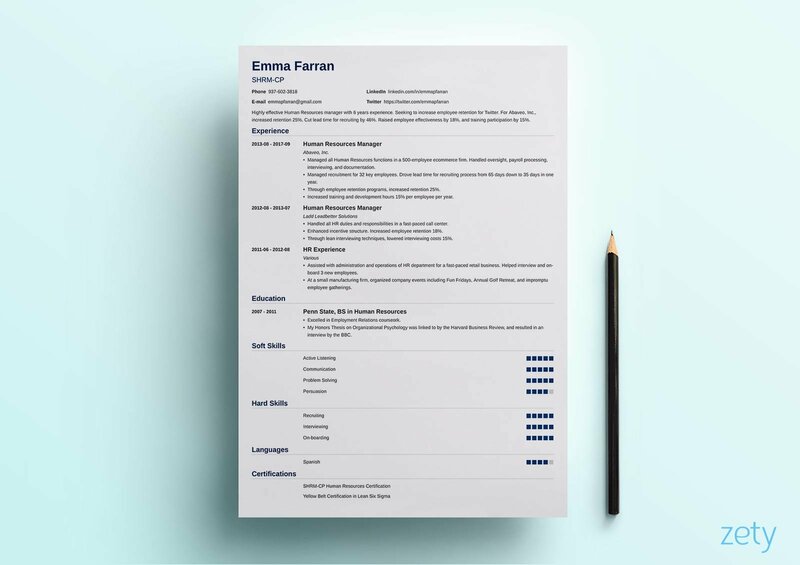 Together with my partner in crime, Luiza, with her discerning eye and flair for creativity, we set out across the internet in search of the best resume examples out there so you don’t have to. Some are ours, some are theirs, but all of them are elegantly-basic resume templates. Over a dozen basic resume template examples better than 9 out of 10 other resumes. 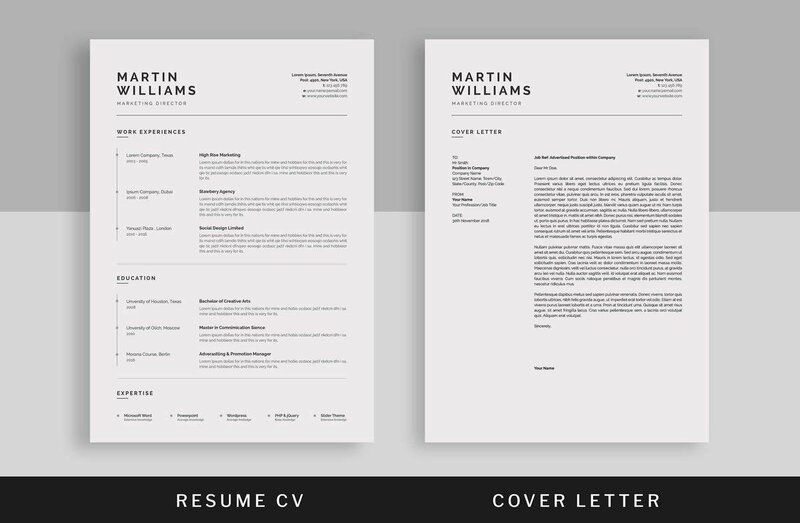 Samples of the finest basic resume layouts from all over the internet. Our top picks of simple, basic templates for resumes available online. Want to save time and have your modern resume ready in 5 minutes? Try our resume builder. It’s fast and easy to use. Plus, you'll get tips and right vs. wrong examples while writing your resume. See 20+ resume templates and create your resume here. Note: we have designed all our resume templates to be ATS-scannable. Primo is one of ours, and we’d like to think that we named this basic template for resumes and cover letters well. A timeline format showcases your education and work history on the left side under your name, while the right-hand sidebar highlights your skills, heading statement, and other sections. Primo is included along with many others in our resume builder. With our resume builder, you can create a resume simply and quickly. 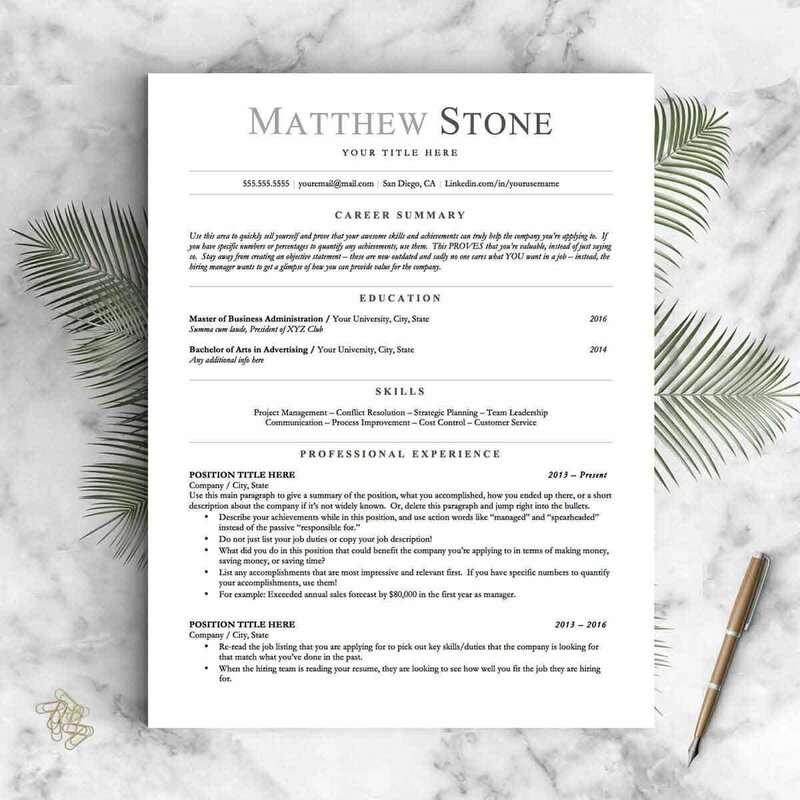 “The Stone” is a basic, 1-column resume template created by Get Landed Design Studio on Etsy. It’s quite a throwback, as you don’t see single-column templates much anymore. Instead of anything too bold, a simple line separates the various sections of this resume, while all caps and a different resume font set the headings apart from the content. This is a two-column resume masquerading as a one-column resume. That left-side column is only used for section titles, allowing them to stand out and letting the hiring manager find the section they are looking for with ease. A standard top-down resume format makes up the remainder of the space, giving you ample room to make your case. And it’s a free resume template that will certainly get an interview for you! 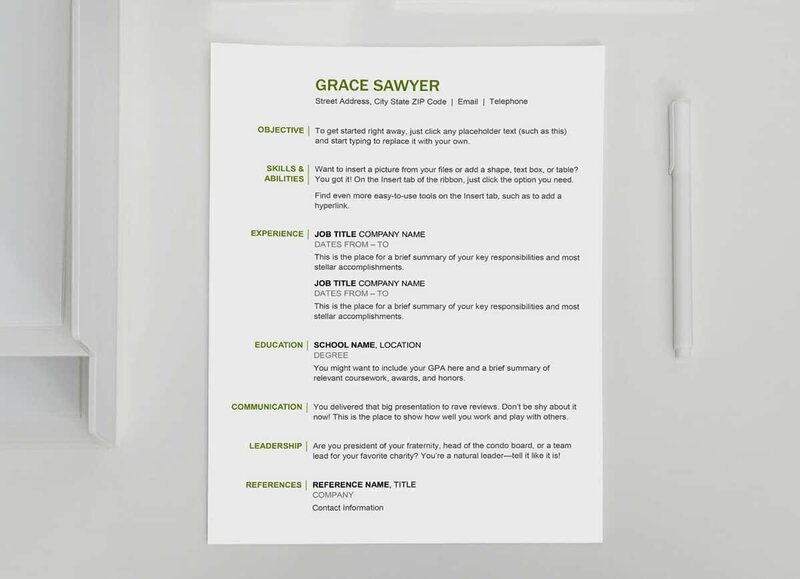 Find this one in the Microsoft Office store (in the templates area) or from within MS Word by searching the “basic resume” templates. 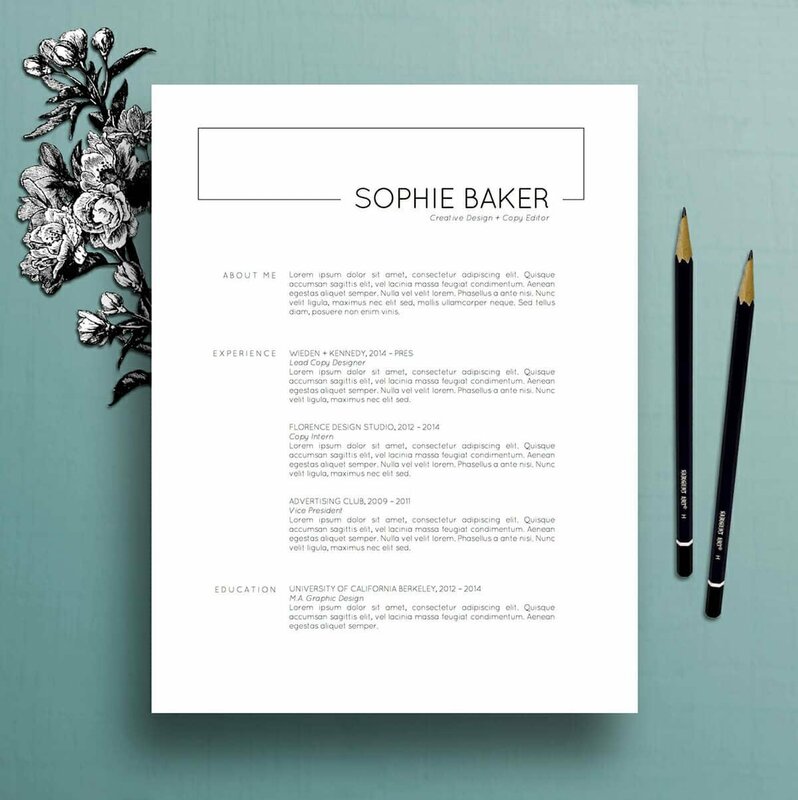 The “Sophie” by Etsy’s The Creative Resume is like a mix of old-school design with some modern elements. The large header area artfully frames your name and professional title, while the remainder of the body looks like the first draft of a Kerouac book (but with more spacing). Either way, its delightful, minimalistic design makes this template easy to read and perfect for your next job application. Here’s the link to this template. 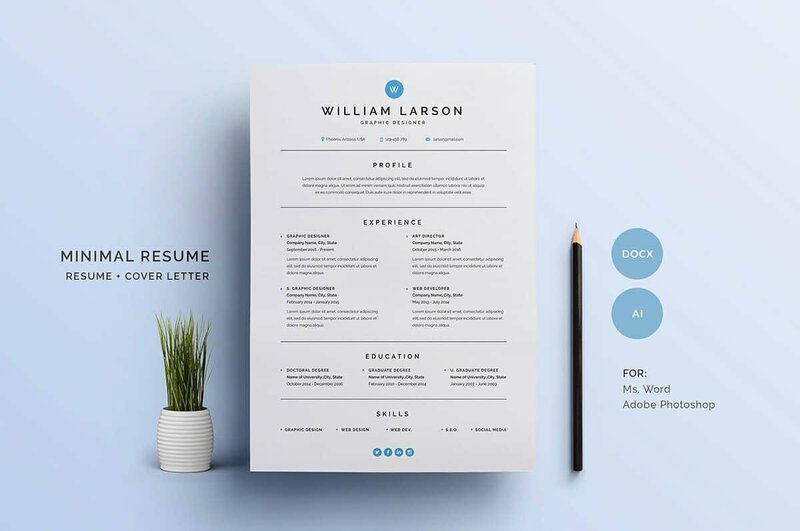 The “Minimal Resume CV” by UX Group on Creative Market is a prime example of the basic cover letter (see our cover letter tips) and resume template. The left-hand column here is used to bolster the strength of the right column by acting as a dated timeline where your work’s and school’s name and city can go. The heading area cleanly lays out your name and contact information. Here’s the link to this template on Creative Market. Nanica is another one of ours, and like many of the other basic templates for resumes here, it allows space on the left side to serve as a timeline for the work and education sections. 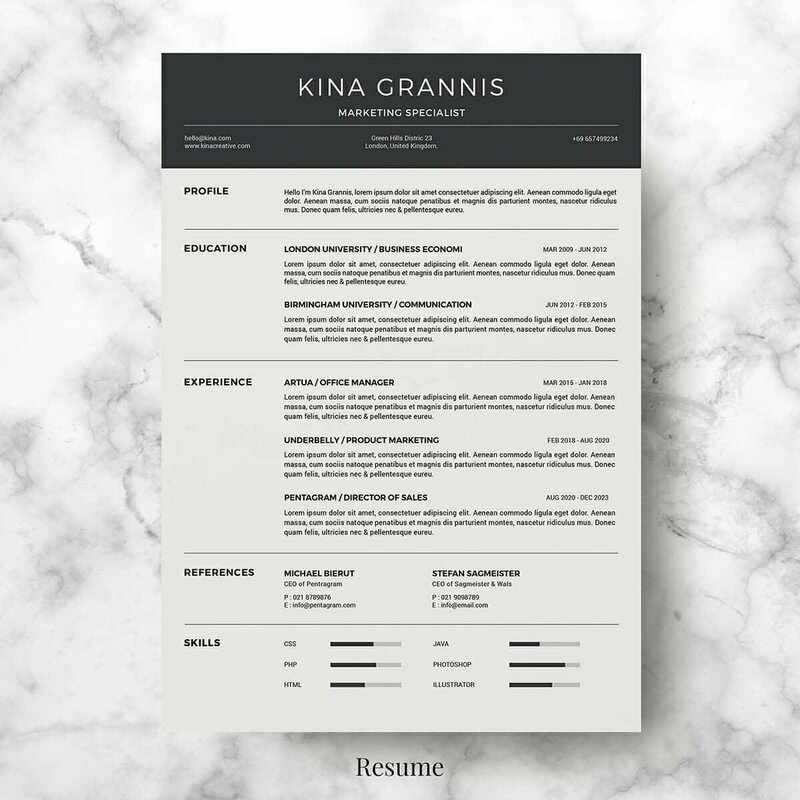 A full-width area for your heading statement allows you to grab the recruiter’s attention with a captivating resume summary or resume objective. Nanica is included along with many others in our resume builder. With our resume builder, you can create a resume simply and quickly. Meant to be used as a one-page resume template (and a one-page cover letter template), this one by Bervisual Studio on Etsy is modern and professional without going over the top. Varying as one-, two-, or three-columns, depending on the location and need. Section headings stand out all the way on the left for easy skimmability. Here’s the link to this template which comes as an instant digital download compatible with Microsoft Word and Adobe Illustrator. This template is one of the best in part because it’s quite modern. 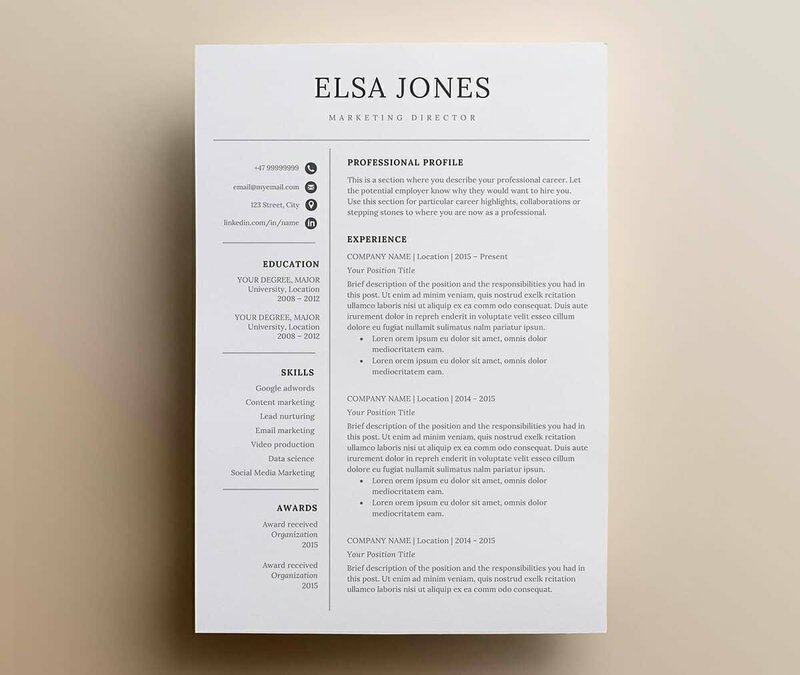 Check out other contemporary ones: Modern Resume Templates & 18 Examples [A Complete Guide]. “Professional Resume Template 01” by Brandson Design on Creative Market is a basic resume template that doesn’t cut corners. It retains its functionality and modernity throughout, with the thin lines separating each of the sections in a clean manner and some nifty icons to define relevant contact details. Here’s the link to this basic template which can be downloaded for Microsoft Word. This “BS” template (probably not the best name, I know) by TNSDesign on Creative Market is crisp and clean and creatively done. A large header focuses the hiring manager’s eyes on your name and professional title or branding statement. Two columns sort out the rest, giving you plenty of real estate to show off your experience, skills, and qualifications. Here’s the link to this template for Microsoft Word or Adobe Photoshop. The “Scandinavian” by Nordic Designs is modern and minimal, like many Scandinavian things are. The full-width header centers on your name and branding statement, while the rest of the page is divided into two columns, giving you sufficient space to talk about your history and goals. Here’s the link to this DOC and PDF template, which also includes a cover letter template. Simple doesn’t have to mean uninspired and boring. Check out our curated list of simple resume templates: Simple Resume Templates: 15 of the Easiest Resume Examples to Use. The “Minimal Resume” by Graphica Shop is just as described. Its minimal modernity is accentuated here with the use of a very subtle blue as a coordinating color, giving this an Arctic ice feel. Varying between one column and two, there is plenty of room here to detail all your past accomplishments and work history. Here’s the link to this template available on Creative Market as a DOCX template or EPS for Adobe Illustrator. 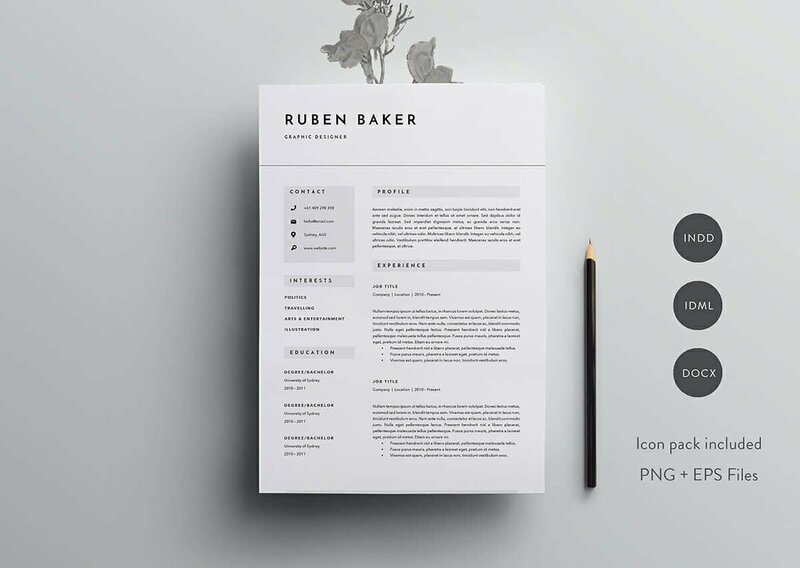 Being creative on a resume like this one is tough, but our guide and examples make it easy: Creative Resume Templates (15+ Examples & Complete Guide]. 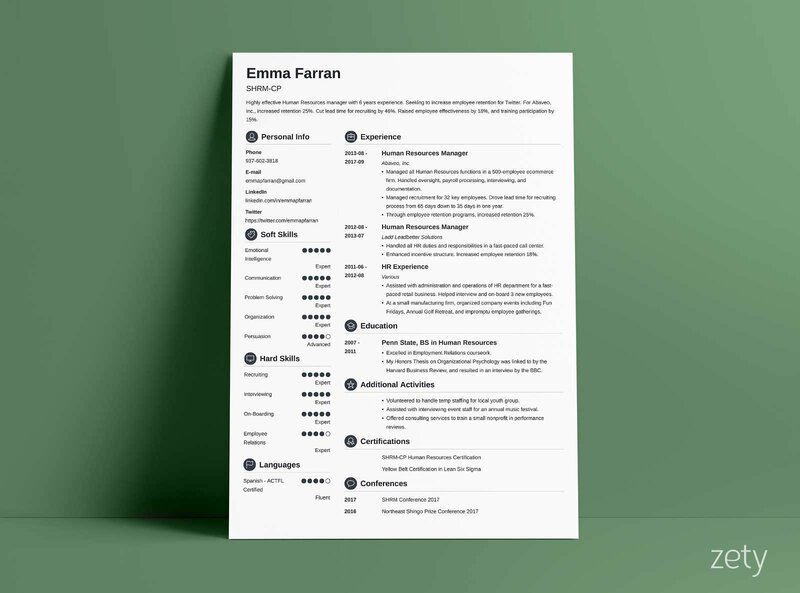 If we can toot our own horn for a sec, we believe Vibes is a very well-designed resume template that still retains its basic features: It has the full-width header for your name, title, and heading statement. A left-hand sidebar promotes your skills and achievements as a bar graph. Square icons make it easy for the hiring manager to locate each unique resume section. Vibes is included along with many others in our resume builder. With our resume builder, you can create a resume simply and quickly. 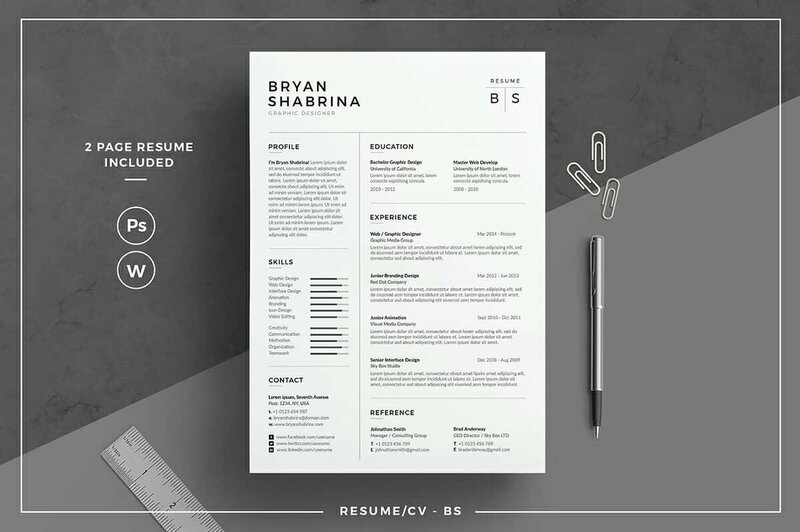 Nazdrag’s “Simple Resume CV with Business Card” is just that: a simple resume or CV template that includes templates for matching business cards, as well. This could be considered a two-column resume, but each of those columns seems to be divided in half, as well, giving the job applicant lots of room to play with. Here’s the link to this template on Creative Market, compatible with Word, Illustrator, and Photoshop in both A4 and US letter sizes. 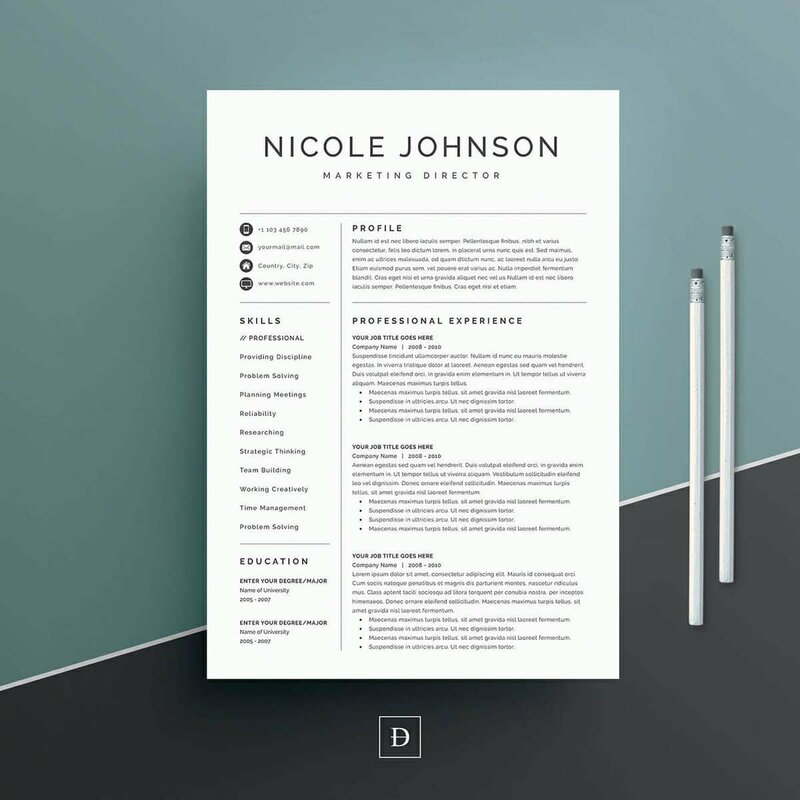 Deme Design’s “Nicole” on Etsy is a high-quality template for resumes that will get the job done. A large header highlights your name and professional title, and two columns below offer you room to write. 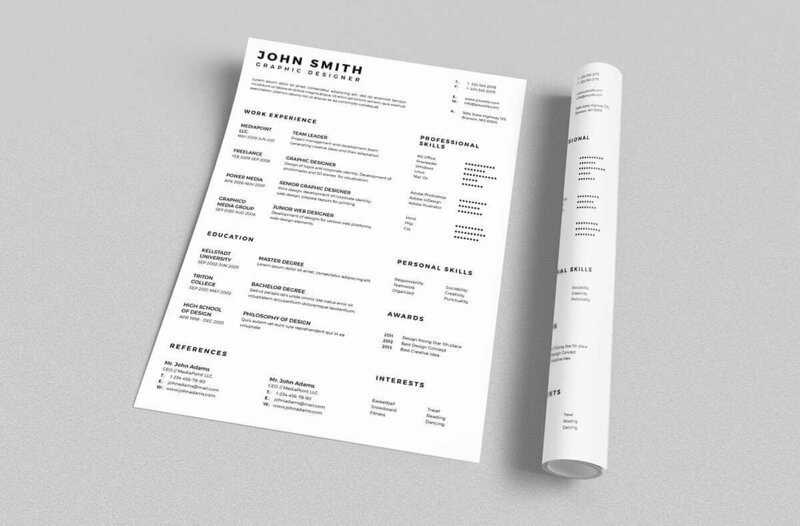 The package includes the basic resume template, a cover letter template, and 22 icons to use for your own personal touch. Here’s the link to this DOCX template available in both US and A4 letter formats. 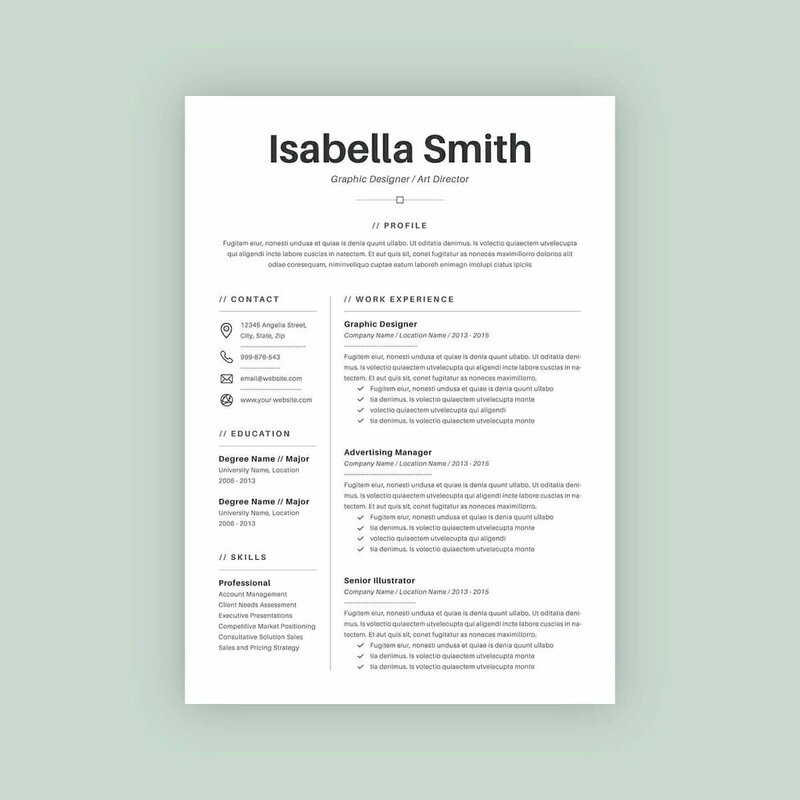 The “3 Page Resume Template” by Basic Creations on Creative Market is a creative resume template that would look great for personal CVs as well as executive positions. 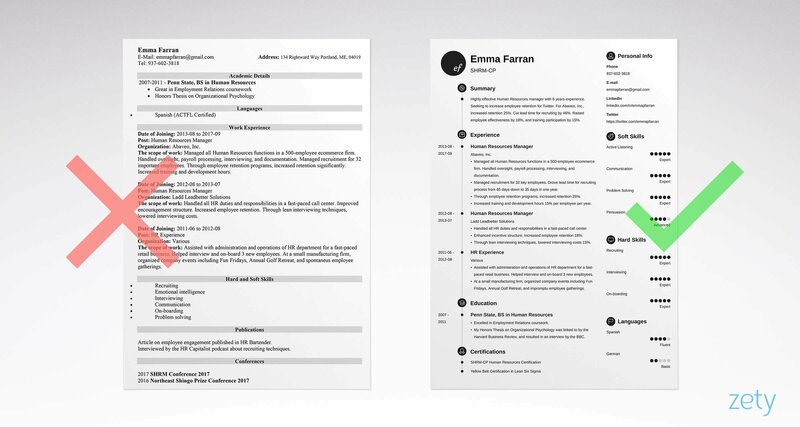 You get a 2-page resume template plus a matching cover letter template with this package. Here’s the link to this template which comes in DOCX, IDML, and INDD formats with extra icons in editable EPS files and PNG files. 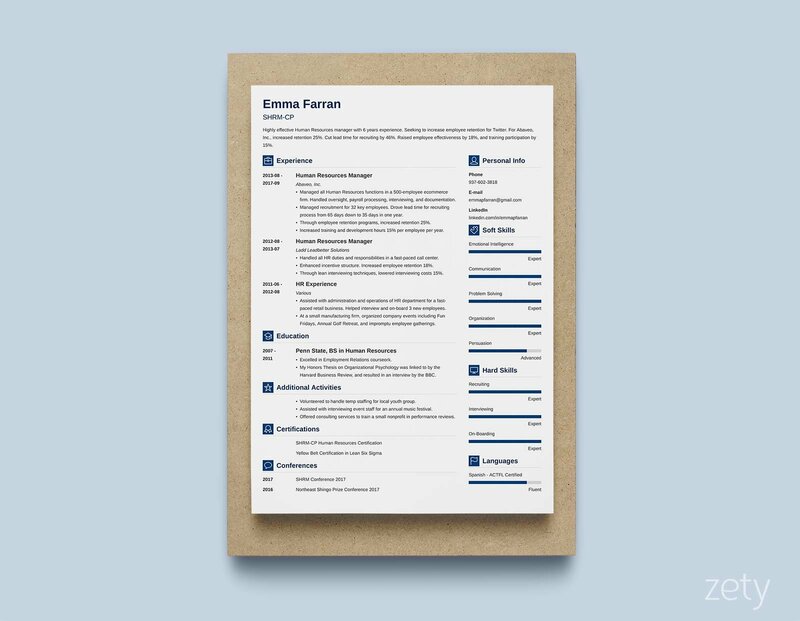 Another of our favorites here at Zety - the basic Crisp resume template made using our resume builder. It’s got a left-hand sidebar, but a full-width header area up top for your name, title, and all-important resume summary or objective. In the skills and language sections, colored circles detail your level of each. Icons precede each resume section for a modern feel. It uses a white background, black text, and a color of your choice for heading titles, or reverse that, if you wish, with dozens of color combinations to choose from. Crisp is included along with many others in our resume builder. With our resume builder, you can create a resume simply and quickly. As you can see, basic resumes don’t have to be boring. Essential elements can be paired with touches of color and design for a hint of flair. The internet offers a wealth of basic resume templates, and we hope that we’ve given you the very best of them. Do you have any other basic resume templates that are amazing and deserve a mention? Let us know in the comments below and we’ll be happy to consider adding your template or answer any question you might have. Thanks for reading! 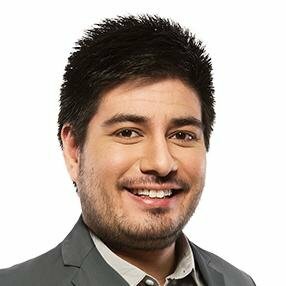 Christian is a career expert who has been writing for Zety since 2017. From job hunting to acing interviews to settling in on the first days at a new career, his guides cover the entire career spectrum. The only way to put accomplishments on your resume. Use these tips and examples to make a perfect resume. Follow these unknown tips to tailor your resume to every job description. Find out what recruiters are looking for. Read more!